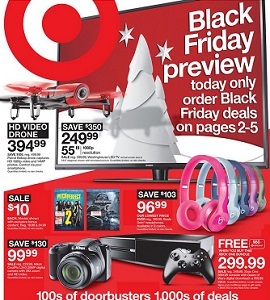 Get Target Black Friday Sale Ad 2015. Target Black Friday Hours: stores will be open from 6PM on Thanksgiving Day. Target Doorbuster Deals – valid from November 26th through November 28th. Shop online – Free shipping, no minimum. Don’t miss Target doorbuster deals: $249.99 Westinghouse 55″ 1080p LED HDTV; $96.99 Beats Solo Headphones; $299.99 Xbox One 500GB Console Gear of War Bundle + Free $60.00 Target Gift Card; 25% OFF All Beats Wireless Headphones; $119.99 Beats Pill 2.0 Wireless Speaker; Melissa & Doug Toys – BOGO 50% OFF; $99.99 Westinghouse 32″ LED TV; $239.99 Element 50″ 1080p LED HDTV; $499 Apple iPad Air 2 + $150.00 Target GiftCard; $299.99 GoPro 1080P HERO+LCD + Free $60.00; $499.99 Nikon D3300 DSLP Bundle; $249.99 Wii U 32GB Cosole + Free Splatoon & Super Smash Bros. Games; and much more.